Planning for a tour to Rajasthan? You are certainly on the right track to enjoy a great holiday. However, your tour should include a visit to some of the fairs and festivals held in Rajasthan. These fairs and festivals will take you most close to the rich culture and tradition of the place. These fairs and festivals in Rajasthan are held across the state. 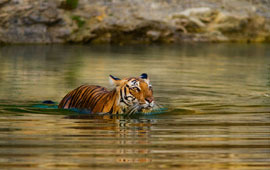 They are very much popular among the local people as the tourists. Among the various festivals held in different parts of Rajasthan, the Dussehra Festival Kota is one of the most popular festivals. The vibrant and joyous mood prevalent in this area during the festival offers an enjoyable experience to the tourists. Kota itself has a great historical significance. Visiting Kota will help tourists to get a vivid knowledge about the rich history of the place. The Dussehra Festival Kota adds to the attraction further more. This festival lets you get a close look at the rich culture and tradition of the place. Moreover, the picture perfect beauty of the place also adds to Kota's attraction as a tourist destination. Attractions of Dussehra in Kota Dussehra Festival in Kota has occupied a significant position in the tourism map of Kota. Located on the banks of the Chambal River, Kota celebrates a number of festivals. However, this festival of Dussehra bears a distinct appeal altogether. The whole area boasts an attractive during this festival. Dussehra is not only a great festival for the fun it offers. It has a huge religious significance in Hindu religion. The mythical association of the festival states that it is to celebrate the victory of Lord Rama over the Demon King Ravana. According to the Hindu religious beliefs, the battle was won by Ravana after a fierce battle of 10 days. Witnessing the Dussehra Festival of Kota is a unique experience for the tourists. The theatrical representation of the encounter is a great show to experience. The theatrical representation is given shape by active participation of people from different age groups This is primarily done to suit the different characters. The drama holds so much importance among the local people and has so much appeal that spectators start chanting in the name of Lord Rama during the show. The climax of the drama holds most excitement as it ends with setting fire to gigantic effigies of 10 headed Ravana. The effigies are packed with crackers and once set in fire; they burst to create an extravagant show. 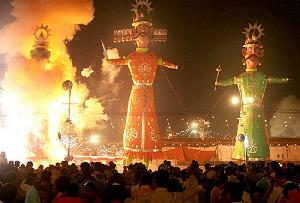 The festival of Dussehra Kota is one of the major attractions of Kota tours. It is a must visit during Kota tours. Hence, if you are planning to visit Kota, try to plan it during the time of this festival and visit the Dussehra festival in Kota. The festival is celebrated during the Hindu month of Ashvin. This month falls between September and October You will surely have a great experience.